When we think about being in solidarity with those of other faiths, one way to show our support is by worshiping with others, in their times of mourning and celebration. Mike (Church Council Member) and Beth (Worship and Music Committee Chair) spent last Friday with our Jewish neighbors in Medford. Beth and I attended a Shabbat service last Friday night at Temple Shalom in Medford. The service was called “A Shabbat of Remembrance, Hope, and Solidarity”. The entire community was invited and there were many people from Medford and surrounding communities in attendance at the service. We were warmly welcomed at the entrance, and given a prayer book and a kippa (or yarmulke). The Synagogue leadership had been thoughtful in their design of the service bringing together community and spiritual leaders who gave voice to the grief shared by the community in the wake of the shootings at a synagogue in Pittsburgh the previous Saturday and a vision of hope that love and faith would triumph over hatred and evil. Embedded in the regular Friday night Shabbat service of prayers and readings for the day were speakers who offered prayers, encouragement, and messages of solidarity and hope. The speakers included the mayor of Medford, three Baptist ministers, a Buddhist monk, an Imam, a Sikh spiritual leader, and an Episcopal priest. The speakers spoke to our common humanity and shared a commitment and invitation to stand together against hatred in service both to love and as recognition of the dignity of every individual. At the end we all sang God Bless America together. And, though it seemed oddly placed in a service at a synagogue, it gave us a way to affirm both our own individual commitments to God as we experience God and to each other as we share in common this country and community in which we live. (Also, as a patriotic song written by the Jewish immigrant Irving Berlin, it was a reminder—or perhaps an defiant declaration—of the contributions of immigrants and Jewish people). Overall, it was a moving experience that united diverse communities in Love and affirmed our commitment to live together in peace. Thanksgiving disrupts our weekly routine. It may bring a feast with family, a "friendsgiving" or a quiet day of reflection. It may be celebratory or tinged with sadness, or both. Perhaps it remains a day of work, or necessary care, or a treasured time of renewal and connection. Whatever Thanksgiving means to you this year - amidst the news of your personal life and community at large - may the disruption bring an opportunity to connect with what brings you solace and what brings you strength. We are grateful for the St. Paul community – for you. Let us give thanks to the creator for all that is given. storing the energy needed to once again feed our people. Andrew and Susan and I were the delegates from St. Paul Church to this year’s New England Synod Assembly in Springfield. It was both more difficult, and less work, than I thought it would be. Immigrants and immigration, for example. Lesbians, gays, bisexuals, transgender people, and queer folks, for example. Israel and Palestine, for example. Global environmental catastrophe, for example. A person of faith must not turn their back on suffering; and there is a lot of suffering in the world. More than a lot. So much is bad, in fact, that it makes you doubt that anything will ever improve: there is just no point in trying. But there was that two-word phrase in there, that two-word phrase that means it’s going to be less work too. “Of faith.” Of Faith. OF FAITH. It kept coming up. In the very first sermon on Thursday when we walked in to the hall. A woman pastor from a Lutheran Church in Jerusalem, Rev. Carrie Smith, spoke directly to me and said it was going to be all right, the healing is already occurring. The phrase was there in the words of the candidates for Bishop as we went from two, to three, to four rounds of voting. Jim Hazelwood is our Bishop again, by the way. It was there again in the words of the very last sermon we heard, preached at the closing worship service. A woman minister from the Massachusetts Council of Churches, Rev. Laura Everett, gave the most articulate, entertaining, convincing, passionate sermon I have ever heard. The work of God, the work of Christ, the work of the Holy Spirit is happening now, right now, right here, right in the middle of the muck, and if you have faith, if you are OF FAITH, you know that, you see that, you can take that and run with it. Whatever the problem, you are not born to decline. You are born to succeed. Makes a person feel proud of where he goes to church. Hello, everyone! My name is Kristy Moore. I am a member here at St. Paul along with my husband, John Christianson, and our two boys, Isak and Jordan. As many of you know, Camp Calumet is the outdoor ministry of the ELCA New England Synod. It is a beautiful, lakefront, year-round camp and conference center. St. Paul has a long history with Calumet, notably two certain former members who are now running the camp, Executive Director, Karl Ogren, and Director of Development, Knute Ogren. I remember coming to St. Paul on many occasions related to Calumet, whether it be our winter staff reunions, or hosting a Bunch of Guys concert during their Take a Breath "tour". St. Paul continues to support Calumet's ministry. 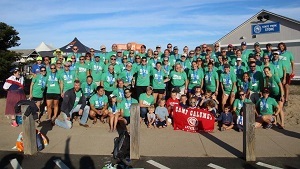 For the last 6 years, Calumet has fielded teams in the 200-mile relay race called Reach the Beach (RTB). The race runs from Bretton Woods to Hampton Beach and takes over 24 hours to complete. A team of 12 splits into 2 vans and make their way, one leg at a time, 36 legs total, from the mountains to the beach. It is also our annual fundraiser for Calumet’s campership fund. On Sept 16-17, I ran with Calumet again this year, for my second RTB. My 16 miles total were beautiful, and yes, tiring on only an hour of sleep! But, it is rewarding knowing the money we raise helps young people and families around New England (and beyond!) to be able to experience the beauty and Grace of Calumet. We have raised over $80,000 this year! I wanted to take a moment to share with you all what this place means to me. John and I met as kids at Calumet and worked on staff together for many springs and summers. This place is my tonic, my refuge, my solace. It is the place where I fell in love with the Lord, the Earth, and my husband. It is the place where my older son learned to ride a two wheeler, and where my younger son first told me he loved me. It is the place where the sun broke through the clouds the exact moment I entered the outdoor chapel with my parents on either side of me in my white dress and the lyrics of Just As I Am filled my ears. Yep, we got married in the place where we met, the place where we both learned about lifelong friendship, hard work, social justice, leadership, God's Grace, the joy of children, and the healing power of the breeze along the lakeshore. The real beauty of camp is that it taught me how to be ME in the midst of those confusing mixed messages of life and love and religion and morality. Are you here or there? Are you devoutly obedient or a charlatan? Are you reserved and reverent or shallow and shameful? Well, maybe I'm both and neither! Aren't we all? Sinner and saint, right? But this place, this temple, allows that paradox to have a space, and makes you feel safe to unpack it in the calm shadow of the Cross or in the glassy mirror of the lake at sunrise. And now, at the end of every summer I have the privilege of witnessing the next generation fall in love with it too. My friends and I get to watch our kids create, compete, explore, concede, sing, and soar like we did. As we walk down the many paths between the soccer field and the lakefront cabins, or between the archery field and the mini-golf course, or up the nearby mountain trails past all the family campsites, I watch them as they bike side by side in front of us and wonder what secrets they'll keep for each other... and from us. I delight in the fact that they will protect each other the way my friends and I protected each other. What will their camp stories be? In the meantime, I am giddy with the knowledge that my camp story continues to be written, not as a young camper, or a counselor, or a trip leader and wilderness first responder, not as a department head, and not as a leadership trainer for the next generation... but as a Mom. Calumet is the single most influential place in my faith formation and that is why I join the efforts in running Reach the Beach, so that campership can be available to ANYone who needs one. Many of you have experienced the joy of Calumet yourselves. Please consider a donation to contribute to these funds that allow children, who would not otherwise be able to afford camp, to go and have the best week or two of their lives! You can learn more about Calumet, RTB, and how to make a donation at: www.calumet.org/followtherace. Even though the race is over, donations are still coming in! Thanks so much. As I write this, St. Paul is in a transition period with our Vicars. Alissa is off to her first call at Good Shepherd in Quincy, and Alex Clark will join us next week to begin his intern year. It’s a good time to reflect on St. Paul’s annual commitment to hosting an Intern and what serving on the Vicar Committee has meant to me. I’ve been fortunate to be part of the committee for the past two years – one as a member during Eric Worringer’s year, and one as chairman with Alissa. The committee supports the Vicar during their time at St. Paul while offering advice, feedback, and a safe, confidential space to share their joys and struggles during our monthly meetings. We also prepare mid-term and final evaluations of the intern for the seminary and synod. Working with Eric and Alissa has been a wonderful experience. As a relatively new (joined in June 2014) member here, I’ve had the opportunity to learn about St. Paul alongside our Vicars. I’ve been impressed by their enthusiasm and desire to move the church forward while still respecting the many traditions here. In their own way, Alissa and Eric each displayed a level of wisdom that far exceeded their age or career experience. With young pastors like them in the pipeline, the future of the Lutheran church is in good hands. I’ve also come to appreciate the diverse skill set required of a great pastor. Compassion, intellectual curiosity, counseling, biblical scholarship, public speaking, and fundraising are just a few of the important gifts displayed by Ross and the many men and women who lead our churches. Recruiting should probably be added to that list – Ross is never afraid to ask St. Paul’s membership to give their time and talents to the church! I’m so grateful for all the members who generously volunteer their time to serve St. Paul. It would not be the same vibrant, energetic place without those who fill so many roles on Sunday and throughout the week on various committees. Remember Alex is a newcomer to the Boston area. He’ll be adjusting to a new city, a new home, a new job, and a new group of 500+ church members. Please tell Alex your name (before being asked) each time you meet him for at least the first three months.It will ease any potential anxiety from having to remember so many names. Remember that Alex is a student who is coming to St. Paul to serve and learn.Although he will be performing several pastoral duties, he is not yet a pastor. Allow Alex the freedom to grow, the freedom to try new things, and the freedom to fail.